Established in 1852, the City Law School is one of the oldest and most respected law schools in the UK. We are a world renowned institution and a leading provider of high quality CPD training for the legal profession and other professional sectors. We offer bespoke in-house training to organisations throughout the world. Our courses are carefully created to support professionals in developing their skills and enhancing their careers. We also provide a range of specialist public courses which are available for individuals to enrol on. Our training courses and materials are regularly reviewed and revised to ensure that they are up-to-date with the latest legal developments. Our trainers are experts in their field and provide direct access to the very latest legal knowledge, skills and thinking in a range of flexible and engaging formats. As a University and a non-commercial training provider, City prides itself on its innovative approach to learning and education. Our commitment and ethos is on high quality learning. Our passion for academic excellence ranks us in the top 4% of universities in the world (Times Higher Education World University Rankings). We are able to deliver courses at your premises or host your delegates at our state of the art facilities across a number of campuses, which include a selection of mock courtrooms and recording suites within our historic Gray’s Inn campus. N.B - Our Charitable status means we do not charge VAT on any of our programmes and courses. For organisations who require bespoke courses for groups of delegates, delivered at their premises. 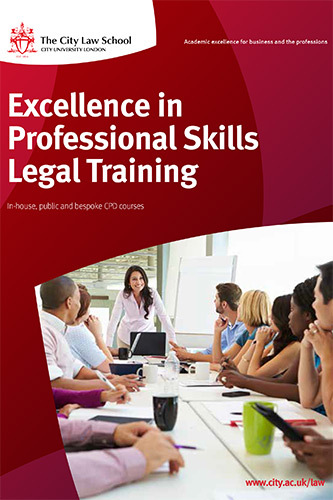 For solicitors wanting to maintain their continuous competence, as well as learn new skills. We offer both Civil and Criminal routes to obtaining one’s Higher Rights of Audience. Gain knowledge and Skills to apply for formal assessment to obtain access to the panel of accredited practitioners. Launched in 2016, the Solicitor Apprenticeship Programme offers a new route to qualifying as a solicitor.